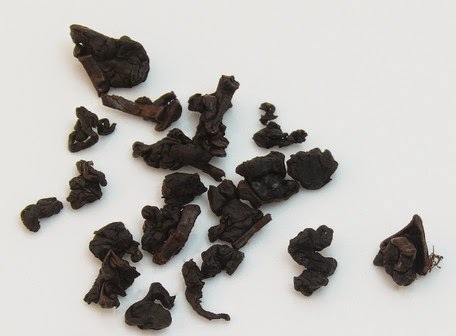 Oolongchaser | Listen to the Leaves: Dark Roast TieGuanYin Oolong from Mountain Tea! A blog about loose leaf tea. Dark Roast TieGuanYin Oolong from Mountain Tea! As you can probably deduce from my other posts, I LOVE DARK OOLONG. It's one tea that I thoroughly enjoy every aspect of it. The look, the smell, the ability to age, as well as many other reasons make this a tea I will certainly seek out for a long time. My love for high roasted teas came when I had my first sip of a 2009 high roasted TieGuanYin from JKTeaShop earlier this summer. I was upset when I returned to the site to find that it was removed and replaced with a 2011-2012 version. After trying both replacements to the 2009, I wasn't particularly blown away with the substitute offerings. Thus, a great search! As one does when they aren't sure where to start, I returned back to one of my favorite tea vendors: Mountain Tea. MT has been discusses on this blog more than any other company because I really do enjoy their offerings and they have very cheap prices. This particular tea at hand is their Dark Roast TGY. For a measely $15 bucks you can get 5 ounces of this black gold. Seriously, 3 bucks an ounce. Im not going to sit here and blab on and on about this tea but I will say that its better than 3 bucks an ounce. Now to the good stuff; The smell that comes from the bag is a rich smokey note that makes me salivate. Its a touch strong so I'm not really detecting anything else off the dry tea via scent. Visually it is crispy dark TGY rolled oolong. Its not going to win any beauty contests but it will win your taste buds. The flavor I get after a quick rinse is a heavy charcoal flavor with a delicate TGY back. It had small notes of cinnamon, caramel and possibly chocolate. These three notes are very muted and took a lot to find due to the charcoal fest happening in my mouth. Don't let me discourage you with all this char-talk, I do in fact enjoy the charcoal flavor. The longevity of this tea is about 5-6 infusions gongfu cha which isn't bad considering the price. The color of the liquor starts out with a mild brown and develops into a deep rich amber/brown color. Its rich, sweet, and comforting. Now for why I'm so excited about this tea; This tea is one that I feel has the characteristics that will let it age extremely well. The only downside(to some) to this tea is the charcoal flavor that is so strong. With some age, the charcoal flavor will theoretically subside and balance into what I feel is an amazing budget dark roast oolong! I will be purchasing a sizable bag to experiment with ageing as soon as I have some Tea-Funds available! Stay thirsty friends!